There is no fun in separation anxiety! Having a dog with separation anxiety can be a nightmare! ​At it’s worst anxiety can cause a dog to harm itself, licking and chewing its paws until they bleed, destroying property or even escaping and running away. Milder cases result in minor destruction and irritating noise. Whining, howling and incessant barking can make for angry neighbors. Destruction and damage to furnishings and household soiling or damage, and a frantic pup is not what anyone wants to come home to at the end of the day. However, with patience and consistency most dog owners can resolve the situation and have a happier, well adjusted dog! Most people expect separation anxiety in new puppies but older dogs can have it too. Some breeds, particularly high energy and working breeds like terriers, shepherds and hounds can be prone to it. Dogs that have come from shelters or rescue groups and have already experienced a lot of separation and change may have a more difficult time transitioning. If you work at home and your dog is used to having you around then suddenly you are spending days at the office, the adjustment can be confusing. Dog’s are pack animals. It doesn’t make sense to them that their pack has just left them behind to go to work. The goal is to get your dog to feel that this is part of the normal routine and that the time you are gone is merely down time. That means providing them with adequate regular exercise, a routine that does not add to their anxiety, not making a big deal out of leaving, giving them a comfortable space that feels safe to hang out in and giving them things to do if they get bored while you are away! Below are some basic tips for behavioral modification that will help you and your dog. I’ve also included links to tools and additional information! A lot of dog owner’s think that the goal is to totally exhaust their dog but they don’t have time to do that every day. They may rush through exercise during the week, then try to make up for it on the weekends with a big hike or trip to the dog park. It doesn’t work that way. And there are some breeds that you just won’t wear out no matter how hard you try. A good cardio workout is important, however, quality and regularity are much more important than endurance! Routine is king! I recommend creating a workable schedule and sticking to it as closely as possible. If you can hire a dog walker or have a friend stop by, a midday dog walk can be crucial if you are gone all day. Just because your dog is able to “hold it” for 8 hours doesn’t mean they are comfortable doing so or that it’s healthy for them. Some form of midday exercise whether it’s a 30 minute walk or an enthusiastic ball throwing session can make a big difference in how calm your dog is throughout the day and when you come home! If your dog walker can commit to a 30 minute minimum, that is ideal. If they can include quality time with your pooch as well, that’s fantastic!. The majority of time, when I make a visit, I don’t just walk or play with the dog and leave. I also give them some companionship, petting, brushing or massage before I leave. If you feed your dog twice a day, walk or exercise them BEFORE you feed them. If they have had exercise first, their natural inclination will be to nap after a meal, the same way wild dogs nap after hunting and feeding. Include if you work away from the house all day. I encourage dog owners to spend a bare minimum of 20 minutes on an outing and preferably at least one 30-60 walk/exercise session a day. As I said, routine is king, however, if your routine is too predictable and precise that can add to the anxiety in a couple of different ways. Your dog anticipates you leaving and that contributes to their anxiety. When your, prone to anxiety dog expects a precise routine and that routine varies one day, they may freak out. Doing the same things in the same basic order most days is great but you can vary the timing a bit. For example, if you are going to be away from 830-6, have your dog walker come sometime between 12:00-230 rather than asking them to shoot for say, 1PM every time. This way your dog has something to look forward to but will also learn that there’s nothing to freak out about while they wait. 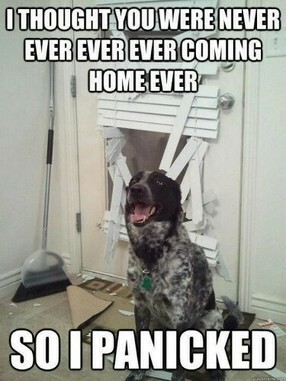 In many cases your dog is not actually having separation anxiety. They are just taking their cues from you. When you leave, if you fuss over your dog, you are adding to the anxiety whether it’s coming from the dog or from you. In general, fussing over your dog, talking baby talk and coddling them just reinforces anxious behavior. It sounds like whining to your dog. Your dog will take cues from you. 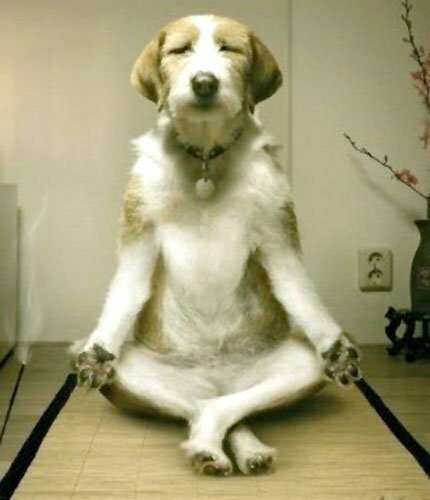 If you are calm and confident the message your dog gets is to be calm and confident as well! When your pooch sees you following a set pattern before you leave each day , they learn that these are the things you do right before you leave; picking up your keys, purse or laptop bag, giving them a treat, telling them goodbye. They see you do these things on a regular basis and start to anticipate your leaving!When your dog doesn’t get these cues from you they are more likely to be a zen doggy! Of course you have to take your purse, keys, etc. with you, however, you can keep them from associating you carrying these items with you leaving. Mix it up. Pick up your purse and go into another room with it. Grab your keys go out and come right back in. Be sneaky. Go outside for a bit without obviously carrying any of these items. Don’t give your dog treats right before you leave. Give them treats randomly, make them earn the treat and don’t overdo it. Don’t crate or feed your dog immediately before leaving. When it’s really time to leave, just leave. In general, I don’t recommend using a dog door when you are at work and I don’t recommend giving most dogs run of the house until the dog has proven themselves to be calm, quiet and trustworthy. Sure, it’s “easier” to provide a dog door than to walk your dog regularly and it’s “easier” to give a dog the run of the house than to take the time to crate train them, but a little effort on your part means less destruction, less clean up and fewer angry neighbors. And when properly introduced, most dogs end up loving their crate! If your dog is new to a crate, you want to go slow. Leave the crate door open. Fill the crate with comfy bedding and some of their favorite toys and snuggly things. Hide favorite treats. Put an unwashed item of clothing that smells like you inside. Let your dog slowly get used to to their crate. At first, only close the door for a few minutes. Don’t lock them in right away. The crate should be a happy place! Never put your dog into it as a punishment! Think of it like a baby crib or playpen. 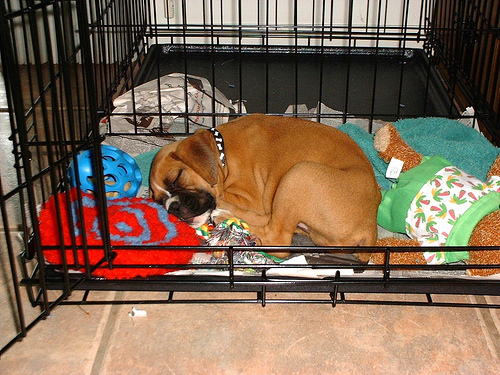 In lieu of crating you can also baby gate your dog in a smaller room or a kitchen. Limited space will actually make your dog feel more secure. Same rules apply, ease them into confinement. Make it a pleasant experience. 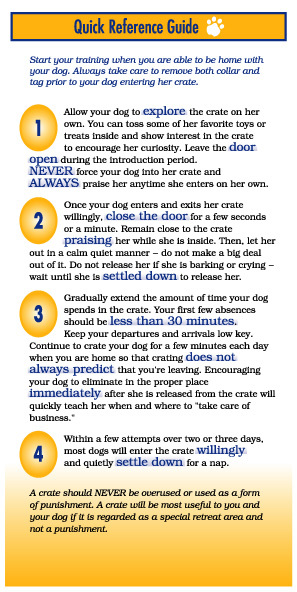 There are lots of good resources on the web about crate training. HERE is an excellent one from PawRescue! Leaving toys for your dog that satisfy curiosity, natural instincts and hunger are always a good plan. Safe durable chew toys that won’t break up or be ingested (no rawhide please) will meet the need to chew and relax your dog. 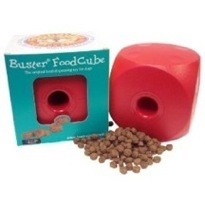 There are “puzzle” toys you can put treats or some kibble into. Some dogs will spend hours trying to get the food out. This satisfies the need to work to get their food (hunting) and once they have conquered the toy and had their fill, they will be more relaxed and likely to nap. My favorite recipe is to make a “Kongcicle.” I fill a kong with a mixture of good quality wet food, cap it with peanut butter or something else that the dog really loves and then I stick a treat in it so that it looks like a popsicle stick. I freeze it overnight. The dog gets a smaller breakfast or the Kongcicle in lieu of breakfast. It takes the dog longer to get the reward from a frozen Kong and they can stay busy, working at it for hours! These are things that are not a solution by themselves but can be helpful when used in addition to the steps above! Leaving familiar house noises like a TV or radio at low volume or a CD designed for calming dogs like “Through a Dog’s Ear," IN ADDITION to the above techniques can add to calmness. There are also some nifty synthetic pheromones that mimic the scent of a lactating mama dog that can be helpful when spritzed about or diffused. Here's One. Here's another. Several of my more desperate clients who had dogs with severe anxiety highly praise the Thundershirt which is akin to swaddling a baby. Severe cases may also be helped with prescription medication like Clomicalm IN ADDITION to behavioral modification training. Yelling, shock or other types of bark collars, clickers, using a TV or music as a babysitter or getting another dog are not going to do much to combat separation anxiety. In fact they may make it worse. Doggy Day Care can be a good option but if you don’t deal with the core issue, the minute you can’t take your dog to day care and have to leave them at home your neighbors will be hating you again! Nuisance barking often has nothing to do with separation anxiety but the plan above will certainly result in a calmer dog which will probably reduce nuisance barking. Going back to the basics is good for your dog and for you too! Going back to simple training, boundaries and a healthy schedule should always be the first step when dealing with any behavioral issue. We always joke that the human needs the training and discipline more than the dog but it's really true! 6AM wake up! If you have a back yard, let the dog out, if not take them out for a quick potty break. 6:15-8:30AM Go about your normal routine of getting ready for work, feed yourself, shower,get ready etc. At some point during this window of time, take your dog for a minimum 15-20 minute walk. Bring them in. Continue your business. Then, before you leave but not right before, feed the dog in or near their confined space. If they have a Kong put that in with them. Continue your business and when you need to leave, just leave! 12-230PM At some point during this window you, your dog walker or friend arrives, exercises and spends quality time with your unconfined dog. 30 minutes minimum. If they have time. 45-1 hour is ideal. Your dog walker should follow the same plan of confining your dog again, but not leaving immediately. And just like you, when they go they should just leave with no fuss or acknowledgement of the dog. 6:00PM Arrive home. Do not greet your dog right away or make a big fuss. Do not let them out the minute you walk in the door unless it's obvious they have an urgent need. 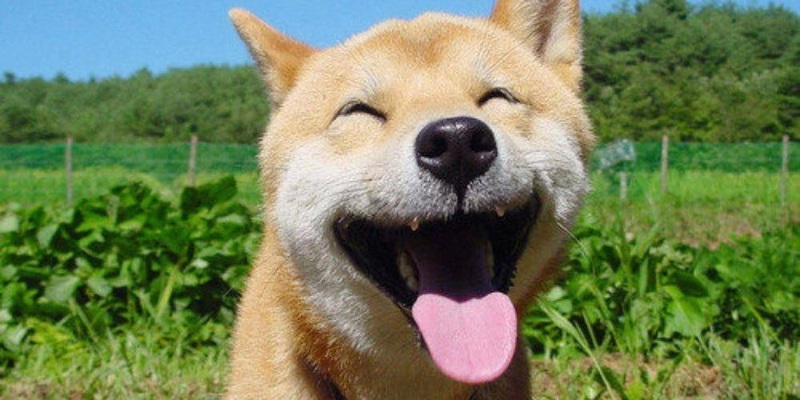 Spend at least 5-10 minutes doing other things, then casually let your dog out and give them a potty break. 6:15/6:30PM When you have been home for a bit, take your dog out for at least 20-30 minutes of exercise. (This is good for both of you by the way) Then feed your dog dinner and go about your normal evening routine. If you work at home some days, you can still follow the routine. This also helps the dog not to associate being confined with you being away. If you have the ability to set up a camera to monitor your dog you can get a better idea of how severe the problem is, as well as see when your dog is experiencing the most agitation. If you have a friend or dog walker coming in, make sure to let them know if you have a camera running so you don’t violate their privacy. If neighbors have complained and you know which ones, thank them for bringing the problem to your attention and assure them that you are starting to work on some behavioral modification and training. Ask them for their patience. Request that they not bang on walls or yell at your dog, but to please let you know how it’s going. If you have helpful neighbors who are home during the day they may be able to help you pinpoint if their are problem hours and you might adjust your dog walker’s window or visit length to accommodate this. If you make your neighbors part of the solution they will be able to feel helpful instead of crabby! On separation anxiety and how to deal with it! I hope you found this helpful and that you and your canine compadre will be on the way to a calmer, happier life! Always feel free to contact More Than Pets: Pet-sitting & More if you have questions, would like an in-home consultation or need services!